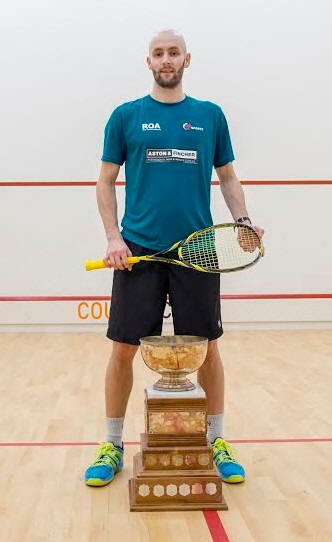 Top seed Jaymie Haycocks ended his week of squash on the same note as he started it. 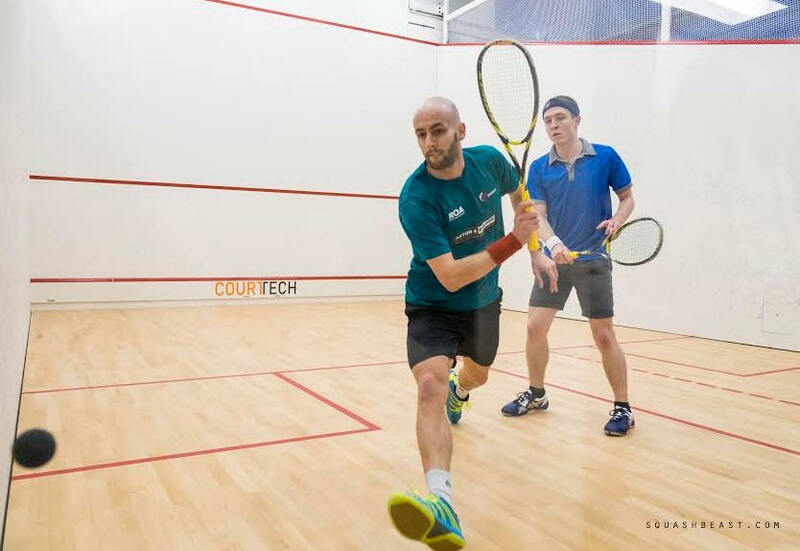 Solid effective squash to beat Mike McCue in straight games in the final. He took an early lead forcing a few errors from the Canadian by hitting quality shot over quality shot. But McCue who also had a week of good squash mounted a comeback with 5 straight rallies to get close at 6-7. But he had to do a lot of work and Haycocks was able to close it out. 'It turned out to be a good thing that that game was longer, he did a lot or work and it took a lot out of him' said Haycocks. This made the 3rd and 4th more difficult for him as I was able to get comfortable leads in both games. "I want to thank the sponsors, the beautiful club we played in, my coach Robert Owen an my sponsors: Ashton and Fincher, Harrow, Ipro Sports, Salming and Ashaway," said the winner. Jaymie continued his strong play and after a first close game was able to control the pace of the match. So far, he is living up to his first seed status hasn't been pushed much. It should be an interesting match up with compatriot tomorrow. The two canadians play each other in Toronto so they both knew what to expect from each other. McCue was in control from the get go and was able to win this one comfortably. First round matches results from the MAA Invitational held in Montreal. Many predicted this one had the potential to be the closest match of the day. After splitting the first two, Ashley took 3rd and 4th comfortably and unfortunately for the canadian, his hamstring started acting up in the 4th. 'Really happy to win, must have been the gingerbread latte. I have been having one every day and I just love them. I wish it would warm up here' said Davies. "I started off strong, I was up in the 2nd but made 6 errors in a row. Came back in the third but panicked in the fourth after a few long rallies when I got winded. In the fifth, I went in thinking I needed to up the pressure so I could control the center more. I relaxed and played simple, it worked! I never played Ashley Davies and he is a strong player so I'll have to play like I did in the fifth. After 2 games where he controlled most of the rallies, the third was a close affair. 'Elliot battled hard in the 3rd, had to regain focus as I wanted to pull out in 3 to stay fresh for tomorrow' said Shoihet. These two had played a month two months ago and David had won in a close 3-0. The local favorite started strong using his favorite shot, his forehand cross court and Cueto was often left flat footed. But David got a bit nervous and struggled in the second while the mexican was starting to read him. A few adjustments to his tactics proved successful as David was able to take the last two to move on to the quarters. 'Always difficult to play at home in front of family and friends, I was nervous the first two games then I was able to settle down and play my game' says the Badger as other canadian players call him. Dairo is a happy camper, in his second PSA event, he qualifies and wins his first round match. 'Matt is an experienced player and got to many of my shots. I had to be patient to win rallies' . 'I am happy about my results so far and I like the atmosphere of the tournament' said the Colombian. 'Tough first round, Edgar is a quick player that likes to open up the court and he is quite good at the front. 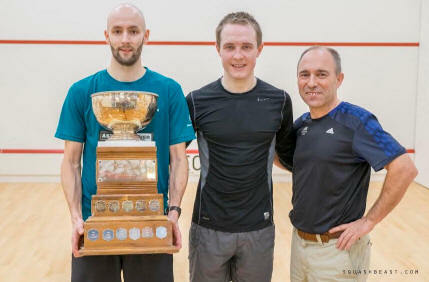 I was able to play good solid basic squash and it paid off. It's sometimes good to have a tough first round match, gets you pushing right away and prepared for the next round' said the winner. The new court is similar to the one I play on at home so I like the way it plays.